About environmental noise level and unit. The sound transmitted through the air is a minute pressure fluctuation centered on the atmospheric pressure. The effective value of the variation component is called sound pressure, and the unit is Pascal (Pa). The range of sound intensity that human beings can feel is very large, and it has a large fluctuation width of 100,000 times from 20 uPa to 20 Pa. Therefore, in order to quantify the physical size of the sound, the ratio to the minimum reference sound pressure (static pressure) is taken and its common logarithm is displayed as the sound pressure level (dB: decibel). In the noise measurement field, the level (A characteristic sound pressure level) corrected by the frequency weight characteristic determined based on human auditory characteristics is mainly used as the noise level. Because this A characteristic matches audibility sensitivity, low frequency below 200 Hz is hardly reflected in sound pressure level. Examples of environmental noise and the level of noise level are shown below. The above can be measured as A characteristic noise level (dBA) by our application "Sound Level Analyzer PRO". However, please note that the explosion sound like aircraft jet engine sound is beyond the limit of built-in microphone measurement. Example 2 of "Low Frequency Detector" measurement. 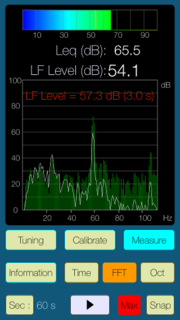 Example of FFT measurement for low frequency noise using "Low Frequency Detector" app. It jumps to the app support page by clicking the below image. Example 1 of "Low Frequency Detector" measurement. 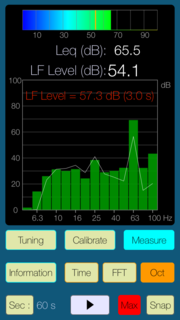 Example of 1/3 octave-band measurement for low frequency noise using "Low Frequency Detector" app. It jumps to the app support page by clicking the below image.